Every DartFrog selected author's book is included in the DartFrog bookseller app, which is available to stores in both desktop and mobile versions. DartFrog reaches out to each author's local independent bookstore to inquire about organizing an event for the author in that store. Every DartFrog selected book is placed face front in a specially branded "DartFrog Approved" section of 20 independent bookstores for a period of three months. As part of our commitment to empowering independent authors, DartFrog invests in a Book2Look biblet ($200 value) for every author who submits a book, whether selected by DartFrog or not. 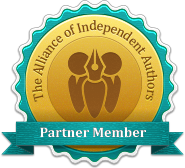 The DartFrog seal is embedded in biblets for authors who have been selected. See sample. We design a custom banner ad for your book and post it in the DartFrog online marketplace, as well as your own author page with links to your social media channels, Book2Look biblet, and bio. DartFrog attends national and regional bookseller conventions every year, and makes highly visible display opportunities available to our authors.